The Dermabraze MD is one sleek microderm machine. It appears to be well-built, yet simple and straightforward. But how does it translate to results? In this Dermabraze MD review, we’re giving you a direct answer. The Dermabraze MD is a handheld device that weighs only 6.1 ounces, making it a possible staple in your travel essentials bag. It has its own power adaptor so that you can use it anytime and anywhere. 2 VIDEO: What’s Inside the Box? 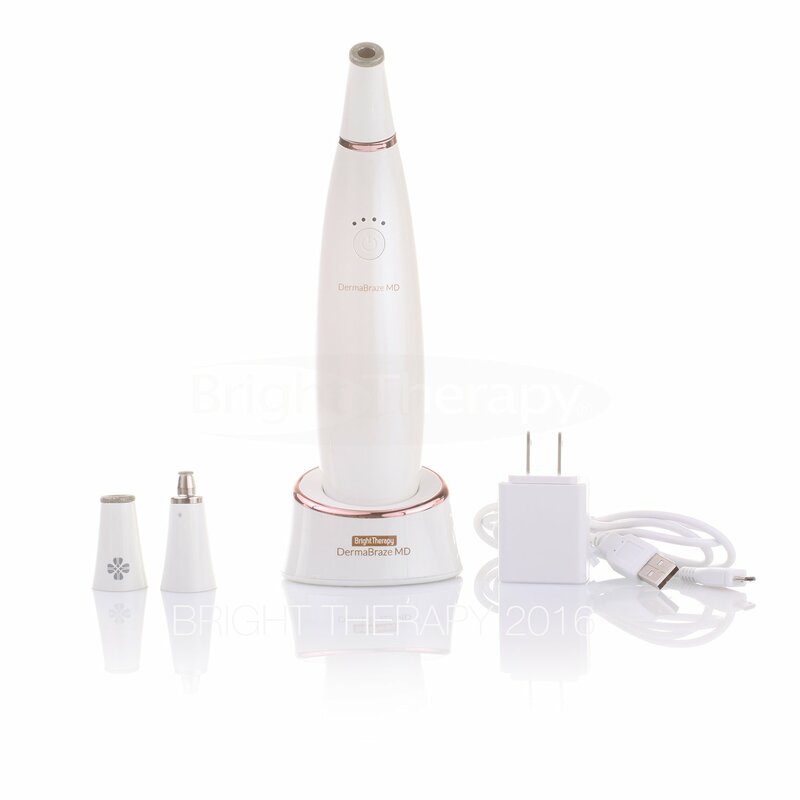 The Dermabraze MD is the creation of Bright Therapy, a company founded in 2006, with offices in the US and in Japan. Aside from the Dermabraze, the company offers other beauty-related instruments such as facial cleansing systems and low level laser therapy (LLLT) devices. So…what makes the Dermabraze special? 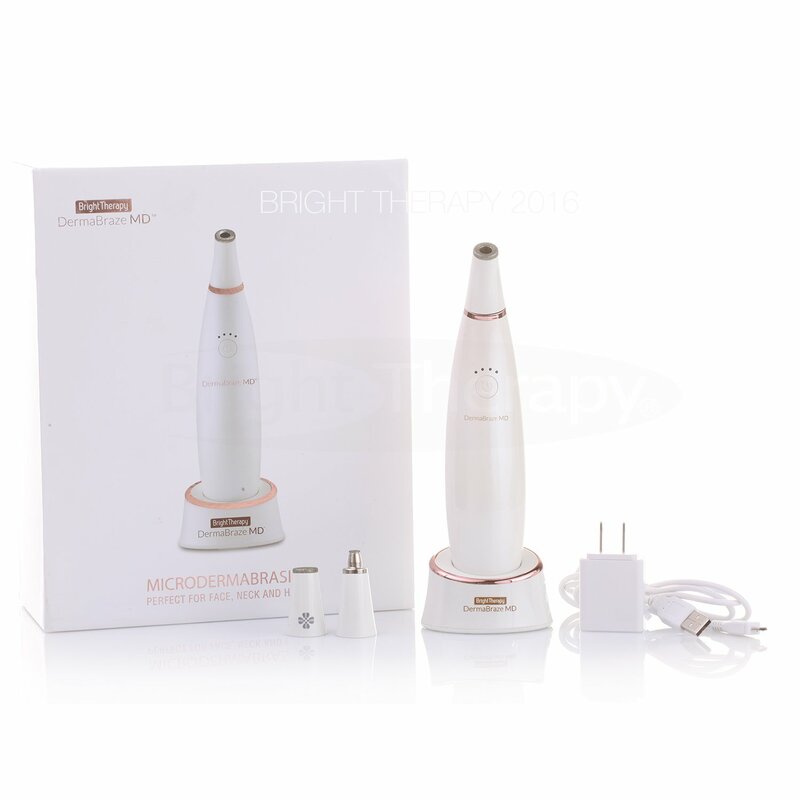 When it comes to the working mechanism, we can’t say it’s “extra-ordinary.” After all, it works basically the same thing as other personal and handheld microdermabrasion machines. To get rid of those unwanted dead skin cells, the Dermabraze makes use of the dual-action of suction and abrasion everytime you glide its diamond tip over your face. But we’re giving it props for its speed settings and tips. It has 4 suction levels, and you have 3 tips to choose from: Standard, Sensitive, and Precision. Is it rechargeable? Yes, it is, and it comes with its own power adaptor and cord. Are there any replacement parts available? Yes, you can buy them at the Bright Therapy website. VIDEO: What’s Inside the Box? Here’s what to expect when you unbox your package. Watch the video to have an idea of how the product looks like, including the parts and accessories. To wrap up this Dermabraze MD review, we’re going to give you a summarized report of what users have experienced with their unit. 1. The Dermabraze MD peels off dead skin cells, based on the many feedback posted on a popular online retailer. 2. When it comes to age spots (liver spots), at least two users have reported improvements after using this device for some time. 3. It does leave your skin feeling very smooth and clean. 4. The unit is well-packaged. 1. A user reported that after using her unit only once, she noticed that some of the diamonds were gone, and she suspects that they have fallen off during usage. 2. Some users had issues with charging. One user said she had to “bend a thin wire back and forth to conduct enough electricity.” Another said that her unit won’t charge anymore after only 4 uses. If you’re not impressed with the Dermabraze MD, don’t fret because there are other options. Perhaps one of these handhelds?